To provide leadership, opportunities for economic growth, professional development and community involvement for our members. A network of business and professional associations and entrepreneurs working together to expand economic development opportunities, serving as an advocate for legislative issues and promoting trade in the State of Utah. The UHCC was established in 1991 with a handful of entrepreneurs who had a vision for diversity in commerce. Over the past few years, the UHCC has become an influential organization and a strong voice for the Hispanic business community in Utah. It plays a key role in coordinating and defining common goals for the relationships between business, community and government. One of the truly valuable benefits of this organization is that it provides an effective and useful forum for members and organization to share knowledge and experience with each other. As Business leaders, Entrepreneurs and those who seek stronger communities, you have vision and drive to nurture that vision into the reality around you. 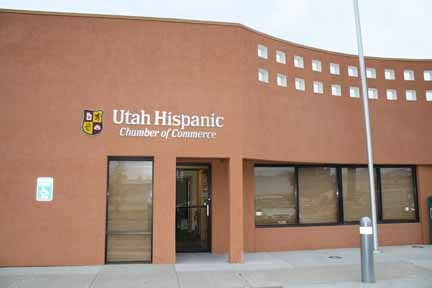 The Utah Hispanics Chamber of Commerce was founded with YOU in mind. We recognize that great accomplishments require the very best in people, the best ideas, the best resources and strong relationships. We have been blessed to attract the very best attributes to our Chamber through Corporate sponsors and talented, dedicated members. Our members form an incredible partnership that you'll have direct access to, offering a wealth of experience and resources to help you achieve your vision and goals. Whether it's a fortune 500 Company, a sole-proprietorship or Non-profit venture your vision for success is highly demanding, the fact that you're even looking into our Chamber demonstrates your exceptional talent and ability to recognize that success is most often achieved by knowing where your resources lie and not depending entirely on you own talent and strengths. The Utah Hispanic Chamber of Commerce is your ultimate resource depot, allowing you to focus on what you do best.